Charter GUINEVERE through the stunning islands of the Bahamas. You´ll reach some of the most beautiful, white sand beaches found anywhere in the world. The multi-colored marine life is a thrill to snorkelers and divers. 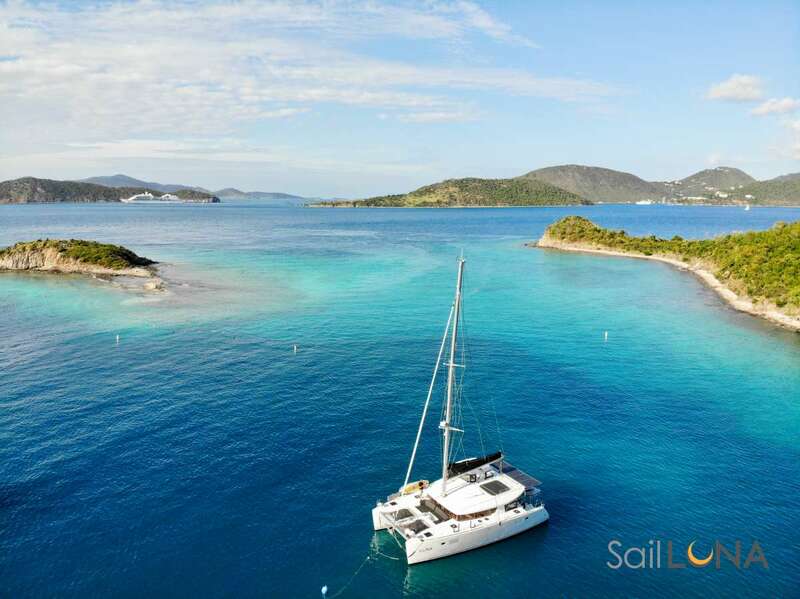 Sailing over the crystal clear, turquoise water is simply spectacular. GUINEVERE is a luxurious, big cruising cat with lots of storage, very private cabins, and spacious common areas. This 2015 St. Francis 50, South African-built catamaran, is also speedy and remarkably stable. Most guests have no trouble walking from stern to bow, without even using the handrails, to enjoy a pleasant ride in the pulpit seat. There are two levels on the boat. The upper level features a huge, double trampoline, great for riding over the waves under the tropical sun. The main deck features a large, covered salon. The rear deck has a double staircase with swim ladder for easy access. There lounge pads on deck for sunning and relaxation. If you prefer the shade, the cockpit is covered and can be enclosed. The lower deck is comprised of the two hulls that house spacious cabins with en suite bathrooms. The fully-equipped galley allows your chef to create menus to suit your preferences. There is also a grill on the back deck for delicious barbecues and grilled fresh catch. The salon comfortably seats six for lounging, dining or watching a movie on the TV/DVD player. There is a stereo system throughout the boat, so guests can listen to the radio, pop in a CD or plug in an iPod / iPhone / iPad and stream music. Three roomy guest cabins are en suite with electric heads, showers, and private locking doors. All cabins have queen sized beds, the master has a tub, and one queen guest cabin is equipped with an additional twin bed. Beds are made up of luxurious 730-thread count linens, lovely soft goods, and plush bath towels. GUINEVERE and her professional crew of three wish to offer family charters, groups of friends charters and retreat style charters. Guests can choose an itinerary designed for relaxation and rejuvenation with an emphasis on yoga and meditation, or opt for an itinerary of fun charter activities; exploring, beachcombing and snorkeling. Rates are the same. Renald holds a Yacht Masters 200-ton limited captain license and has sailed thousands of miles, both single-handed and as crew. He has studied yoga for over 18 years. Michelle is a certified yoga and breath work instructor. Terri is a highly experienced, charter yacht chef. Come sailing on Guinevere in the Bahamas and take home wonderful memories. Michelle spent as much time as possible away from urban life, in the wilderness and on the beaches. Eventually, she moved to Vancouver Canada to live in the mountains and to be closer to the ocean. She says, ´In Vancouver I sailed monohulls. I prefer the energy of the water and the simple peaceful life it offers to be on a sailboat.” She has a degree in dental hygiene and worked in this industry for thirty years. She is also a yoga instructor and holds a Yoga Teachers Certificate, and coaches breathing, wellness, leadership, and a healthy lifestyle. Send us an inquiry to get specific pricing for Guinevere. Despite the changes to our travel plans, and the crew were so accommodating. The catamaran was in fantastic condition for us and Ren was a super captain. There was plenty of space for everyone. Breakfast was a delightful bonus! We enjoyed staying on Guinevere and learning more about life on a catamaran and sailing in general. Ren was very gracious about our daily schedules which took us on and off the boat several times. We look forward to crossing paths with Ren & Chef in the future. Kelley and young Family from York SC. Such an amazing stay! We didn’t want to leave and cannot wait to return. Ren was an absolute pleasure to have with us. A truly unique and unforgettable experience. Thank you!!! An amazing boat. The crew were nice and easy to communicate with. Staying on the boat was fantastic. From morning swims to evening sunsets, it felt like a true vacation to spend 3 days living on a beautiful sailboat in the Newport Harbor. Ren was a great captain. He picked us up with our luggage from the dock and got us well oriented for staying on the boat. Breakfast was delicious (coffee/tea, juice, yogurt, granola, muffins, and fresh fruit). Staying on the boat was easy to get accustomed to. The boat is gorgeous, far and away the fanciest boat I´ve ever been aboard. Each of the 3 rooms has a large bed that easily sleeps 2. Each room also had its own bathroom with shower and small storage area. Like all boats, spaces are smaller but we had ample room for all 4 of us guests and our belongings. Such a special experience! 5 stars. Roast Beef with Roasted Vegetables & Provolone Cheese. When the fishing is good... Fresh fish is top priority!